Does God exist in the Marvel Universe? Yes, God exists inside the pages of Marvel comics . . . but also doesn't. Look, comics are weird, okay? Does God exist inside the Marvel Universe? But, as with so very many things in mainstream comics, it's simply not enough to give a thumbs up or down. Comics don't work that way. As they say, comics — in particular, Marvel Comics — are weird. First it bears noting that it's hard to nail down any particular detail, be it narrative or theological, about anything in the wide, wild Marvel Universe. The closer you look at any element of it, the more bonkers it gets. Over almost eight decades, Marvel's once small interior has grown into a cosmos that encompasses anywhere from 1,000 to 7,000 characters appearing in more than 30,000 printed issues, hundreds of individual television episodes, dozens of big-screen movies and warehouses upon warehouses of licensed products. Churning it all out has been an army of thousands of writers, artists, directors, producers, editors, actors, production staffers, product designers, marketers, lawyers, executives and more, all of whom have different and sometimes conflicting approaches to the brand's characters and the various worlds in which they live. Some of these people are or were devoted members of various faiths (Marvel titans Stan Lee and Jack Kirby were raised Jewish, FYI). Others are or were steadfast atheists. Some just don't care either way. The result is a bubbling stew of contradictions that surface in befuddling, if entertaining, ways. And, yet, despite all these different, diverse creators, various ideas, themes and loosely held truths have floated to the surface over time. Though never concrete, they are about as close to facts as this loopy universe offers. Within the continuity of the almost 80 years of Marvel (previously Timely) comics, hints pointing to the existence of a supreme power that resembles the Judeo-Christian understanding of the Almighty have cropped up here and there. A good example would be the short, much-unloved 1998 series "Punisher: Purgatory." 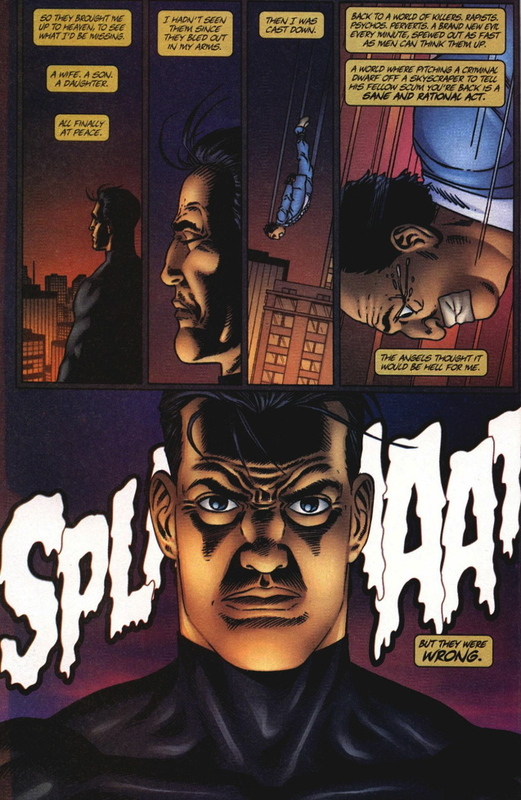 In it, the titular street-level vigilante Frank Castle commits suicide, only to be resurrected as a sort of avenging supernatural agent tasked by a guardian angel to right wrongs and fight demons (comics are weird). While the existence of the Christian God is never spelled out in bold type, many of the narrative elements here depend on his off-panel existence. But "Punisher: Purgatory" is also a perfect example of how such alignments with more traditional theologies also rarely grab hold in the Marvel canon for more than a few moments. Just months after "Punisher: Purgatory" wrapped up, Frank Castle was back, with precious little explanation, as a living, breathing, powerless mortal dropping mafiosi off the Empire State Building. The angels "brought me to heaven," Frank recalls. "Then I was cast down." Beyond that, there have been few mentions of Castle's time in the army of Heaven since. It's clear that the influence of Judeo-Christian thought runs deep through Marvel's characters as well. Figures such as the various Ghost Riders, Daimon Hellstrom, the Satan-like villain Mephisto and more have origins that flirt with the Christian notions of Heaven and Hell, damnation and salvation. Daredevil, in particular, has long been portrayed as a practicing, if conflicted, Catholic in both the comic books and his ongoing Netflix series. As Evan Narcisse — an editor at Gizmodo Media's sci-fi portal io9 and a Marvel comics scribe in his own right — told Salon, the character, "goes to confession, his mom is a nun and he's actually fought Marvel's main stand-in for the devil (Mephisto) multiple times. His mix of impulsiveness and self-righteousness leans heavy into the guilt complex most Catholics have and makes for good story fodder." Other characters have been observant devotees of Islam (Ms. Marvel, Dust, etc. ), Judaism (Kitty Pryde, the Thing, etc. ), Buddhism, Hinduism and other faiths. Dan Slott, the longtime scribe of many of Marvel's extensive line of Spider-Man titles and the writer of beloved runs on "The Silver Surfer" and "She-Hulk," talked to Salon further about the role religion plays in the lives of many Marvel characters. "Punisher was practicing to be a priest at one point," he says. "Moon Knight was a Rabbi's son. Marvel is the 'world outside your window' and that world is religious, so at times that's reflected in the comics as well." He notes that he himself is the writer who, "while not the one who first said Ben Grimm [The Thing] is Jewish, was still the guy who gave him a Bar Mitzvah." Slott is right about Marvel's longstanding claim that it reflects "the world outside your window." Despite Luke Cage's blasphemy-avoiding use of "Sweet Christmas," many Marvel characters exclaim "Oh my God!" in the way many of us do at just the same sort of moments. One of the few moments where God is invoked in the popular Marvel Cinematic Universe is actually a sideways joke in director Joss Whedon's 2012 epic, "The Avengers." Warned by the Black Widow not to tussle with Asgardians Thor and Loki because they are "basically gods," the square, traditional Captain America responds, "There's only one God, ma'am, and I'm pretty sure he doesn't dress like that." It's more a nod to Cap's hokey pre-war value system than it is anything else. In addition, Narcisse remembers that, "One of the best-selling comics in the world was a Pope John Paul II one-shot written, if I recall correctly, by Steven Grant, who also was the writer behind the popular Punisher revival of the 1980s." Oh, and some rather peacocky baddies once crucified Wolverine. Yeah. However, no character element or plot point of this kind establishes Marvel's as a truly God-fearing universe. Judeo-Christian influence is strong at The House of Ideas. But perhaps more constant in the Marvel Universe than traditional religious narratives or concepts is the notion that many of humanity's supernatural and mythological traditions descend not from some sort of divinity, but from powerful alien forces. Moviegoers are familiar with the fact that Thor and all the figures of Norse mythology are not gods, but mighty extra-dimensional, extraterrestrial creatures. They know too that Doctor Strange's magic also has a cosmic origin. Greek titans, ghosts, demons, devils, spells, sorcerers and more also rest on sci-fi underpinnings rather than truly divine or mystic ones at Marvel. There's a slew of reasons for this, but the age into which Marvel was born and the sci-fi fans who helped birth it are key. Inspired by post-war optimism for what they saw as a bright, industrialized future (and commercial factors to be discussed later), early Marvel creators adopted a notion similar to Arthur C. Clarke's adage that, "Any sufficiently advanced technology is indistinguishable from magic," and applied it to theological beliefs both ancient and contemporary to create their colorful universe. Remember that these were either true believers in the post-war dream of a better tomorrow or card-carrying members of the '60s counter-cultural movements. To them, Western religions were things to be studied with skepticism and the answers to everything — if they existed — were held in science or non-Western mysticism. Nonetheless, dues had to be paid to the Judeo-Christian culture writers came from and the company solid comics in. As well, there were crucial thematic, cultural and, ultimately, commercial concerns. 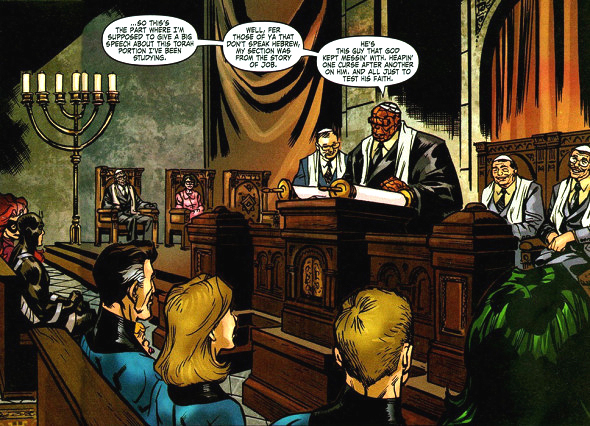 Narcisse agrees that, "Historically overall, Marvel's been very circumspect with regard to directly acknowledging the cosmology of organized religions, including Judeo-Christian ones." Part of that, he argues, comes from the company's famous "world outside your window" approach. The characters in the early days of the brand were, he says, "everyday people with money problems and crises of confidence. Their challenges and their solutions were embodied in people themselves." The Almighty just couldn't be a day-to-day player in these dramas. As Marvel grew, things got more . . . well . . . weird. Care was always taken, though. "When creators aimed for more trippy and existential stuff in the 1970s, like Adam Warlock's nemesis The Magus, who ran an oppressive religious cult," says Narcisse, "any commentary was more elliptical." Narcisse argues that another factor for the publisher's unique handling of the presence of God is "a congenital fear of offending people." He adds, "Back when Stan Lee was still an active force in Marvel editorial, he was keen on building Marvel as a hip, likable brand. The last thing he'd want is a parent picking up a comic and seeing a character pray to a deity that their family didn't believe in." This safe, relatively smart way of approaching the realities of the market eventually became company doctrine. According to Narcisse, "this proclivity merged with a familiar kind of corporate thinking which aims to pump out engaging yet inoffensive product at high volume. There've been works that skirt this sensibility, of course, but Marvel's House of Ideas isn't a House of God." Warren Ellis — the co-creator of the beloved DC properties "The Authority" and "Transmetropolitan," the author behind "Red" and "Red 2" (both adapted into film) and the writer of a long list of Marvel titles including "Iron Man," "Moon Knight" and many, many more — talked to Salon about working at the publishing house with this odd balance in place. "When I started at Marvel," he said, "it was still under the grip of the Comics Code, a nonsensical and constantly shifting grip of random censorship, and as a result, all the work felt kind of blandly, normatively white Christian." Christian, yes — but not necessarily truly pious and certainly not liturgical. Ellis adds, "Gods and demons were always massively advanced technological creatures or extra-dimensional entities, but, reading, it, you never lost the sense of an implication of a giant unseen space daddy." Ellis gives at least one amusing detail about working as a skeptic with an unseen space daddy in the room. It's the sort of "elliptical" commentary Narcisse mentions, albeit one done with a mallet. "I dimly remember inventing an alien race during my first time at Marvel . . . the Uncreated . . . who hunted down [their] god, killed and ate it, and then murdered any culture they found that still had religion," says Ellis. "I found my amusements where I could." He adds, "This is where I tell you, to no surprise whatsoever, that I'm a patron of the British Humanist Association." So the existence of God at Marvel could be more of an unseen influence hanging over the head of writers and editors than a deity directing the lives of its heroes. That said, there are some on-panel depictions of figures resembling something like popular notions of the Most High. Narcisse tells of a 1970s adventure in which "An evil sorcerer character in a Doctor Strange arc pretty much became God but, even then, writer Steve Englehart had to be subversive in how he approached that." This kind of bonkers, one-shot scenario is not unique in the canon, but it's not of real consequence. At other times, Marvel has referenced the Almighty more explicitly. Yahweh, a deity that looks like, acts like and even talks like the classic modern notion of the Judeo-Christian God, has made four appearances in Marvel superhero titles from 1980 to 2016. Cast as the supreme being of earth's Bible-based monotheistic faiths, much as Odin is the leader of the Asgardians or Zeus the head of the Olympians, Yahweh has yet to find a regular home in continuity. His actual status as God is unclear and two of his appearances came in issues of the metatextual, self-lampooning "Howard the Duck" books in the off-cannon Marvel Max continuity. You can't really depend on him as your ongoing Almighty. References to Buddha and Allah or actual appearances of Hindu devas and other deities haven't been dependable or regular either. Rather, it's through the few rare appearances of a very particular giant space daddy that Marvel has come closest to establishing the presence of a supreme, sublime power in their universe similar to the one spoken of across various monotheistic religions. First referenced in the pages of "Doctor Strange" in 1976, the "One-Above-All" (also known as "Above-All-Others") is not only the creator of the universe and everything in it, but the omnipresent, omnipotent arbiter of all events. Often depicted as a glowing humanoid, the One-Above-All also is all things in a Augustinian sense. Through its direction of its right-hand man, the near omnipotent three-faced judge and enforcer, the Living Tribunal, the One-Above-All sometimes intercedes or passes judgment on human-level affairs, but also pops up when comic forces are in conflict. The One-Above-All has been called "God," and "love" seems to be at the core of its power. That said, it is presented as sci-fi figure, albeit one with a clearly Judeo-Christian/Islamic provenance. Again, the One-Above-All is a cosmic, rather than holy, being. Like Yaweh, the total ink spent on the One-Above-All/Above-All-Others comes in a very short stack of issues. More than that, many of these issues only feature references to this deity rather than actual appearances and often have cosmic and sci-fi, rather than faith-based, narratives. As well, most of these appearances have occurred within the last two decades, with other, more established characters such as Infinity, Eternity, the Watchers and the Living Tribunal taking on God-like roles and filling God-like duties depending on the writers or editors involved. Note that the Living Tribunal, who does the work of the One-Above-All, died in combat in 2015 only to be replaced by the alternate-universe version of classic character Adam Warlock. So there's that. So, yes, God — or a God — exists in the Marvel Universe. In the end though, the brief appearances of beings such as Yaweh and the One-Above-All — however ill-defined they are, however rarely they appear — show that God actually isn't a regular, healthy part of the Marvel Universe as a character. In truth, God at Marvel is a loose, unmoored thing spread across a number of powerful alien beings, narrative winks and nods, generalized editorial trends and, as far as this writer can tell, wholly unspoken rules. As Narcisse, Ellis and many more have noted, there are strong commercial, capitalistic reasons for this. But, when speaking about his work on Spider-Man, Slott also talked about writing dialogue in a way that might suggest another, more positive reason for the strange half-in/half-out existence of God in the Marvel Universe. "During my close to 10 years writing Spidey," says Slott, "I have had him say 'Dear God' or 'Oh God' a few times. But more often than not, I try to avoid it." He says he does this not out of piety, but out of a willingness to share the character. "As a more mainstream, iconic character," he says, "I feel that everybody has a stake in Spidey, no matter what their religion." He adds, "Children of all religions should feel like Spidey isn't excluding them." Surely, Slott's parsing just a little bit of his writing process here. Yet the emotion, the philosophy behind it, seems genuine and significant. Marvel is in the hard spot of wanting to invite in a world of readers and viewers, young and old, Christian and Muslim, pious and doubting. Sometimes creating a feeling of ownership for individuals in that broad audience means giving the majority of its readers who have grown up in Judeo-Christian culture something like a Judeo-Christian God. Sometimes that means skipping the issue entirely because of the pitfalls and feelings of exclusivity it could create. Sometimes that means inventing an army of militantly anti-clerical deity-eating armored space lizards (comics are weird). Yes, Narcisse is right about the brand's "corporate thinking" and "congenital fear of offending people" (though it's been doing a pretty good job of offending people lately). That's just good business. Ellis is also right that top-down hewing to old codes and old ideas has produced a bland, "normatively white Christian" patina across a universe where an unseen space daddy looms over characters, readers and writers alike. There's also the backgrounds of the early, influential creators to consider. But, per Slott, it's helpful to remember that Marvel comics creators are usually Marvel comics fans themselves — fans who want to share their love of whatever top-tier or obscure character they're writing with as many people as possible. Keeping God talk at bay for this very personal, positive reason is just as powerful a motivation as the economic and cultural ones discussed above. And, in any case, the compound result that all of these forces and all of these in-universe quirks have created is somewhat ideal. The way God drifts in and out of existing in this universe, the way God's spoken of and not spoken of, the way God appears as one thing to one writer and then appears as a wholly different thing in the hands of another, the way God provides solace to the pious, the way God is used violently as a cudgel by the radicalized, the way God can divide, the way God can unite, the way God just doesn't matter at all to a great many of us — all of it mirrors exactly God's presence in the real world away from the printed page. In more than a few ways, the weird Marvel Universe is very much "the world outside your window," and its God is just like ours.